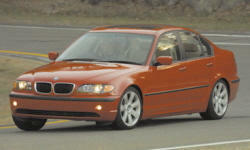 2003 BMW 3-Series Pros and Cons | Page 1 of 1 | Why Not This Car? What drives people to buy (or not buy) a certain car? TrueDelta's members share 2003 BMW 3-Series pros and cons based on their real-world driving experiences. My vehicle is a manual transmission. Enough said. Love the sound and feel of the inline 6 engine coupled with my first manual transmission. The car was a joy to learn to drive stick on, and now I cannot go back to an automatic. Ridiculous for what you get. Extra cost metallic paint and folding rear seat! Vinyl seats in a $30k+ car?! Our previous E46 BMW was bullet proof, fast, and good looking, it handled well, and got surprisingly good milage. Only after we survived a terrific accident did we discover that it is considered super safe in acidents.